The vast majority of Oracle SQL books discuss some syntax, provide the barest rudiments of using Oracle SQL, and perhaps include a few simple examples. It might be enough to pass a survey course, or give you some buzz words to drop in conversation with real Oracle DBAs. But if you use Oracle SQL on a regular basis, you want much more. You want to access the full power of SQL to write queries in an Oracle environment. 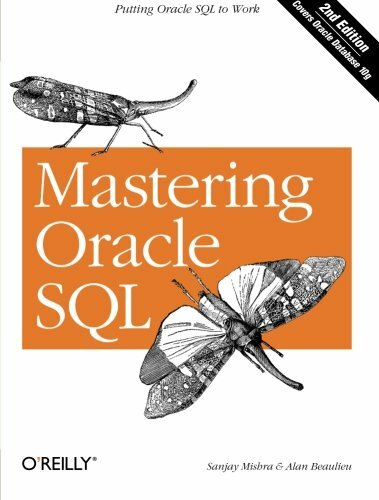 You want a solid understanding of what's possible with Oracle SQL, creative techniques for writing effective and accurate queries, and the practical, hands-on information that leads to true mastery of the language. Simply put, you want useful, expert best practices that can be put to work immediately, not just non-vendor specific overview or theory.Updated to cover the latest version of Oracle, Oracle 10g, this edition of the highly regarded Mastering Oracle SQL has a stronger focus on technique and on Oracle's implementation of SQL than any other book on the market. It covers Oracle s vast library of built-in functions, the full range of Oracle SQL query-writing features, regular expression support, new aggregate and analytic functions, subqueries in the SELECT and WITH clauses, multiset union operators, enhanced support for hierarchical queries: leaf and loop detection, and the CONNECT_BY_ROOT operator, new partitioning methods (some introduced in Oracle9i Release 2), and the native XML datatype, XMLType.Mastering Oracle SQL, 2nd Edition fills the gap between the sometimes spotty vendor documentation, and other books on SQL that just don't explore the full depth of what is possible with Oracle-specific SQL. For those who want to harness the untapped (and often overlooked) power of Oracle SQL, this essential guide for putting Oracle SQL to work will prove invaluable. View More In Data Modeling & Design.